I need brain breaks. Breaks for my brain. Moments in my life when I need to escape what is currently going on and do something…else. Not just anything else though. If that were the case then I’d go fold that laundry that’s been balled up in the basket in my laundry room for a week. I have discovered that I need an escape to another place of thought.I need to be given something new to “chew on” that is light and easy and fun. I find that this Brain Break works really well when I am overwhelmed with a problem and I feel stuck. Many times, when I take a Brain Break and then come back, new ideas sprout up where there were none previously. I was having one of these moments about a month ago so I went to Barnes and Noble to look around. I wasn’t sure what I was looking for but I felt like B&B was a good place to start. My kids were with me so when we got into the store I gave them the basic “Do not, under any circumstance, behave in any way like you are at a playground.” and “Come when I call you.” speech. Afterward they saw a table with shiny, interesting little things on it and went straight there. I followed. We found so many cute things but I was not prepared to purchase them all so, as is my usual way, I grabbed all of them and went to find a table at the cafe so I could thumb through and investigate. I left Barnes and Noble having spent much more than anticipated but with items that I truly needed. Fun, whimsical, light, sweet, inspiring (but not in a corny way), smart, small moments to escape that are just for me. 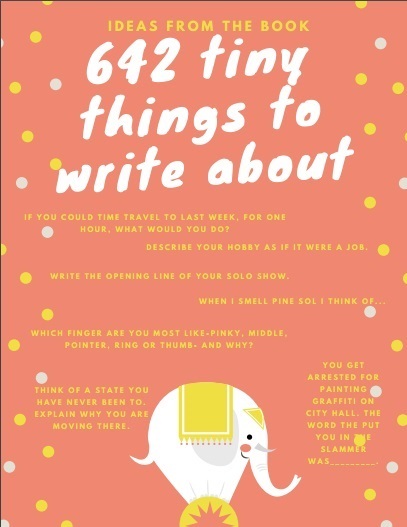 One such item is a book of 642 tiny things to write about. I immediately fell in love. Why? Because the day before was horrible and it helped to be reminded that the year before wasn’t. I needed to recognize that the short view can be a trick bag and that is why the long view needs to stay in sight. Click here for a printable of some of these prompts. I hope you enjoy them as I do. The point of this Brain Break is to intentionally get totally absorbed (for a few minutes) in something that is surprising and fun and gets you thinking in a possible new way or about a new thing. It won’t cause the arduous to disappear but if your brain needs more than silence…like, you need your thoughts to be redirected… sort of the way a 5 year old who has glimpsed the ice cream hidden behind the frozen peas needs to be redirected to something else interesting, then this may help. Share your fortune cookies with us in the comment section! What s great post…. most of the writing ideas made me perk up a little and inspired a creative thought or two…Thanks D for letting me Piggy back your Brain Break for one of my own. I wonder if that series has a FB or IG page that send you a thing to write about once a day…. Or maybe a glance this way could… All things to consider. My fortune cookie from yesterday would read “plans to be productive will overcome the trap of procrastination”. Last year’s fortune cookie would read “the reward for your perseverance will make the challenges forgettable”. Thanks for sharing your fortune cookies with us!